Salescaster L Series NEMA 12 Industrial Grade Displays are designed to improve productivity and efficiency. 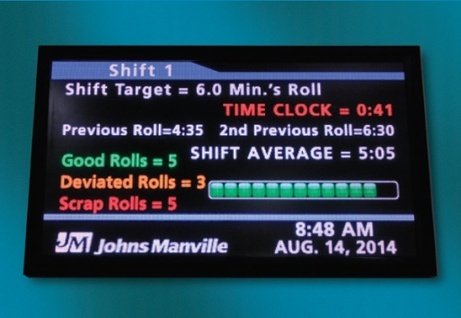 The energy efficient L Series supports your manufacturing operations with real-time visual communications. Enhance lean initiatives with live metrics immediately on the factory floor. With ultra bright clarity and reliability, the L Series operates at a portion of the cost of traditional LCD displays. Simply connect your Windows PC or Windows Media Player into the L SeriesDisplay via HDMI / DVI and USB. L Series Display with integrated i5 Windows 7 embedded processor is compatable with SeQunt™ and FWI™ software packages Also supports SCC™ POSMON™ and Plantwatch™ Protocol emulators. Advantages: No need to connect external media players, simply install the software of your choice. Alpha Communication Protocol is a factory floor software enabling you to send important fields and functions directly to L Series LED Displays. ► Full Matrix High Resolution LED Display with flexible configuration to accommodate your ever changing needs. ► .3″ (7.5mm) resolution for graphic and text applications. ► Hardware cost is competitive with older line matrix ANDON solutions. ► Long term cost is significantly reduced due to flexibility of the full matrix display and the open architecture. ► Supports industry standards – No custom protocols, so no complex development. ► Greatly reduce integration costs by using your existing software tools. ► Communicate safety awareness and production messages. ► Supplement ADA and safety program requirements. ► Display current production status reports. ► Report customer service problems as they are logged & resolved. Show quality and financial reports in both text and graphics.